• Produces uniform section thickness to speed immuno- and histochemical studies. • Provides maximum operator convenience to avoid laborious and messy hand operations. • Specimen size up to 20 mm square and 3 mm thick; maximum stage traverse 25 mm. • Sectioning speed range variable from 50 to 200 strokes per minute. • Rapid mounting and demounting of specimen. • Uses standard razor blades. • Automatic drive with manual positioning facility. • Prepare stage by cementing filter paper to top surface. • Liquify agar by heating in boiling water. • Attached specimen to stage by using agar. Allow to cool. • Set thickness and speed. 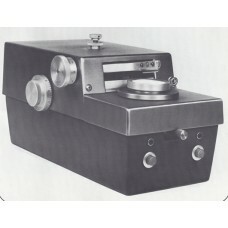 Sectioning range continuously variable using Calibrated Dial from 5 μm to 230 μm, holds agar-embedded specimen up to 20 mm square by 3 mm thick; variable Motor Speed Control; 50-200 strokes per minute; Calibrated Stroke Force Adjustment Dial; 25 mm lateral mechanical stage movement, Automatic Safety Interlocks, Push-Button Start and Re-Set Controls. Accessory Box with Tools and Supplies, 3-wire cord.